Why Cleanse & Detox Your Body? The body is like a highly complex engine. It runs on whatever we feed it. If we feed it what it needs, it runs great, if we feed it what we shouldn’t, it starts to malfunction and break down. Just like our car, we also need tune-ups. unfortunately, most people tune up their car more often than their body. A car expels its waste products through the exhaust system, our bodies do the same via the bloodstream, respiration, and other processes. In short, Nutritional Cleansing involves nourishing the body with the perfect combination of nutrients that assist in clearing out the unwanted substances in your body. It’s not a colon cleanse which is based on using fiber laxatives or diuretics. Instead, it involves using nutrition to help the body perform at its best by ridding it of harmful substances, naturally. Natural ingredients are used to assist the liver and cells in ridding the body of harmful chemicals and impurities. This helps offset the effects of toxins, which can accelerate the aging process. Why do we need to Cleanse & Detox? Every day our bodies ingest a multitude of chemicals, toxins, and impurities from the food we eat, the air we breathe, the water we drink as well as the personal care products (including lotions, cosmetics, and toothpaste) we use. Free radicals are everywhere. When we cleanse & detox, we help eliminate these toxins from our system and provide it with antioxidants, which combat the free radicals. What Benefits does Cleansing Provide? 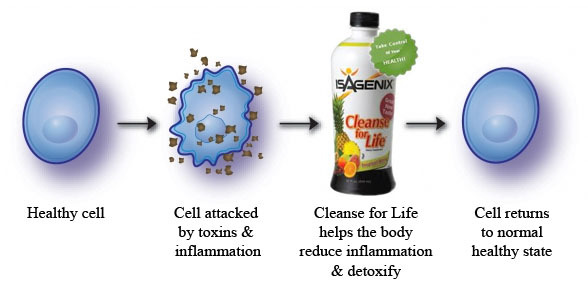 We’ve had great success with the Isagenix program’s “Cleanse for Life” product. In liquid or powder formulations, it is easy to take, palatable and reasonably priced.